I finally got a chance to watch this film today. I wasn’t sure if I was going to bother, but I’m home today and, well, there’s really nothing good on TV on Sunday. But I had originally avoided it because of how I suspected it would turn out, and I was right. I believe that Muhammad Ali is a great man, and was very courageous for his stand against The Vietnam War. Even Will Smith’s ALI, which I generally liked, didn’t really show the full consequences of what he went through in standing up for his beliefs, in my opinion. This was a REALLY brave act, and the possible consequences he was facing were huge. Jail was a real possibility, and there was reason to believe that he would never be allowed to box professionally again, causing him to face financial ruin. And, in the beginning, the general public was largely against him, not just White people, but Blacks as well. Whether you agree or disagree now with Ali’s stance, you have to at least admit that he was sincere in his beliefs, and did more than most celebrities today would do for what they believe in. So getting a look into his mind, what made him feel this way, and the personal toll that it took on him, would be very interesting. But this film does none of that. Like many, if not most, Hollywood films about significant events in Black American history, this film focuses on White people and how they react to the racist society around them. 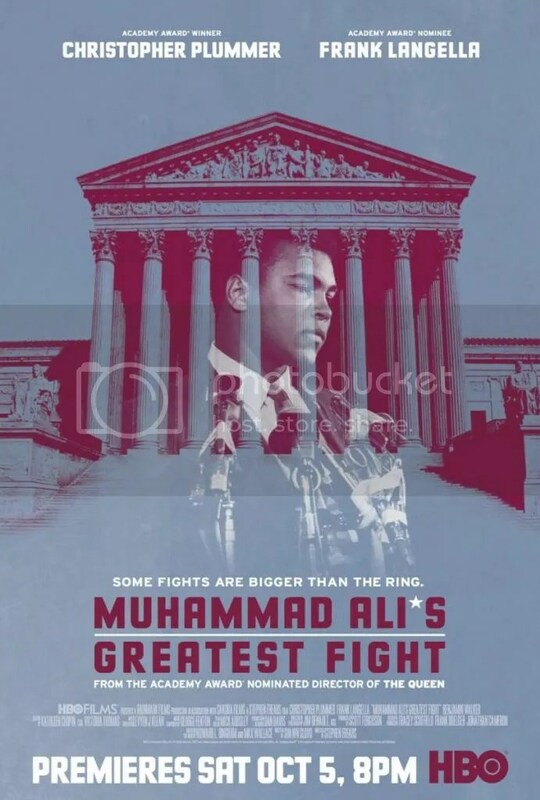 Ali himself only appears in this film in the form of various news clips of him speaking and being interviewed on TV that are spliced throughout the film, reduces him to the role of spectator in this film that has his name in the title. The lead character in this film is actually Kevin Connolly, played ably by Benjamin Walker, who is the newly hired liberal law clerk for conservative US Supreme Court Justice John Marshall Harlan (played by Christopher Plummer). We see him learning the ways the Court operates behind the scenes, including the large role the various clerks play in influences the Justices in matters of which cases to here, and how to craft their opinions. Kevin butts heads with some of the other clerks, most notably Covert Becker (played by Pablo Schreiber), an arch-conservative. It’s also about his growing admiration for Justice Harlan, and vice versa, despite their ideological differences. And when Ali’s case come before the court, against the wishes of Chief Justice William Burger (Frank Langella), it is Kevin who convinces Justice Harlan to change his vote, which was initially against Ali, and convince the rest of the court to unanimously vote in Ali’s favor. Hallelujah! The White man saves the day again! Okay, I’m probably being a LITTLE harsher than this film deserves. Walker, Plummer, and Burger are all very good in their roles, but I still got a very strong “The Help” or “The Butler” vibe from the approach this film chose to take. Even Thurgood Marshall, the lone Black Justice, is sidelined here. That could be justified due to the fact that, Marshall did recuse himself from the case, so wouldn’t have been actively involved anyway. But it still felt like he was portrayed as an absented minded old man. He mistakes one of his law clerks for a former law clerk. Mumbles a few other words, and that’s pretty much it. A total waste of Danny Glover’s talent. If you want to know a lot more about this case from Ali’s perspective, instead of watching this film, I’d recommend the book of the same name, by Ali’s best friend Howard Bingham.